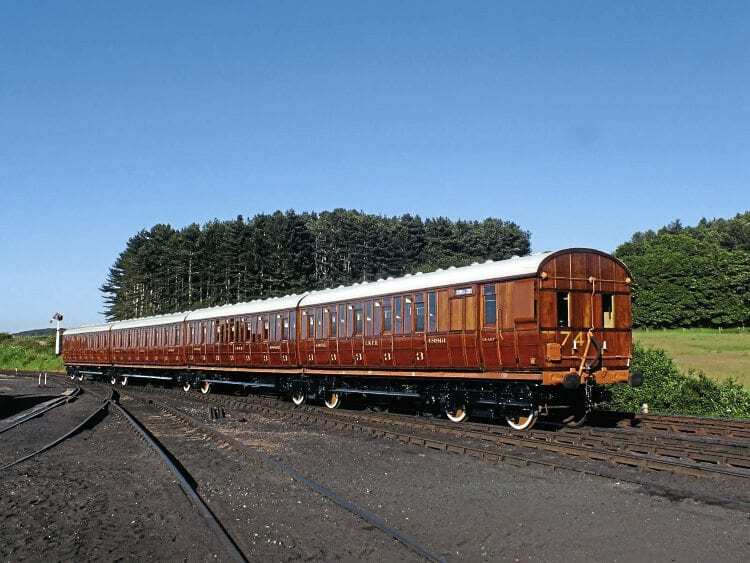 THE North Norfolk Railway’s historic Gresley Quad-Articulated suburban carriage set No. 74 has returned to front-line service on the Sheringham to Holt line after an absence of two years. The 350ft-long set (Brake Third No. 48861 and Thirds Nos. 48862, 48863 and 48864) were withdrawn in 2016 pending routine maintenance and bodywork attention. However, the considerable length of the set and its inability to be split meant it had to wait for a window of opportunity when one road on the Carriage & Wagon Works was free to accommodate it. The interim overhaul has included the repair and repainting of the roofs, while the teak body sides and ends of each carriage were sanded back and re-varnished – a job which is undertaken every two years. Interior paintwork has also been refreshed, new brake blocks fitted together with interconnecting flexible vacuum brake pipes.